As a help to the management of the bibliographic references obtained during a documentary research, there are a series of programs designated bibliographic reference managers, that allow to create a database of bibliographic references for personal utilisation. They are tools that create, maintain, organize, share and give form to the bibliographic references of articles from journals, books or other documents from different sources of information (databases, journals, web pages, etc.). Therefore, bibliographic references managers are a fundamental tool in the development of academic papers and research. In general, different existing references managers share the same basic functionality: storage of bibliographic references; description, organization, and retrieval of references; creation of bibliographies and citation tools, as well as sharing references. Some managers incorporate also online social network features for researchers. Refworks Is an agent of bibliographic references on line, useful to create a personal bibliographic database accessible via Web. It is a resource hired by the University of Alicante. The institutional licence allows his use to all the University Community. In the actuality, are working of simultaneous way so much the classical version of Refworks (Refworks Legacy) like the new version of Refworks. It is necessary to take into account that this new version of Refworks still is in period of implantation of part of the functionalities of the Refworks classical and of development of the new options of capture and visualisation of registers and of simplification of the interface. Refworks clasico Will be operative, like minimum, until finals of 2018 . The new Reforks adds new functionalities like the possibility to realise annotations and include comments in the documents stored and manage them of form colaborativa; the incoporación simultaneous of references and documents in pdf to the agent; and the possibility to insert appointments and generate bibliographies so much in Microsoft Word as in Google Docs. The users of Refworks Legacy that they wish it can migrate his account to the new version of Refworks, although only they will transfer the references and the structure of folders. They will not matter the attachments to the references neither the structure of subcarpetas. The new Refworks works with an only account by user. It recommends no inciar still the process of migration to the users advanced of Refworks, neither to which have initiated the insertion of appointments and bibliography in the preparation of a work of investigation. It consult with Punt BIU if it wishes to initiate the migration. The creation of the personal account has to do from a computer connected to the network of the UA. With Refworks Legacy can use any agent of email, but to give of high in the New RefWorks has to have of an account of institutional post of the University of Alicante. The Library of the University of Alicante is working in the preparation of materials. You can consult so much the resources of support that facilitates Refworks, in English , and in Spanish as well as the tutorial elaborated by the mates of the Service of Library of the University Pablo of Olavide. The Library offers courses of training on this agent of references. Mendeley Is a bibliographic references manager that combines a web platform with a desk version incorporating functionalities of the social Web allowing the connection between researchers, comments and annotations -shared on documents in pdf format- and the promotion of your own works. The University of Alicante has the institutional version of the bibliographic references manager Mendeley ( Mendeley Institutional Edition, MIE ) that allows the university community to enjoy of a series of advantages over the free version. To enjoy the conditions of the institutional version, you have to join the institutional group "University of Alicante". 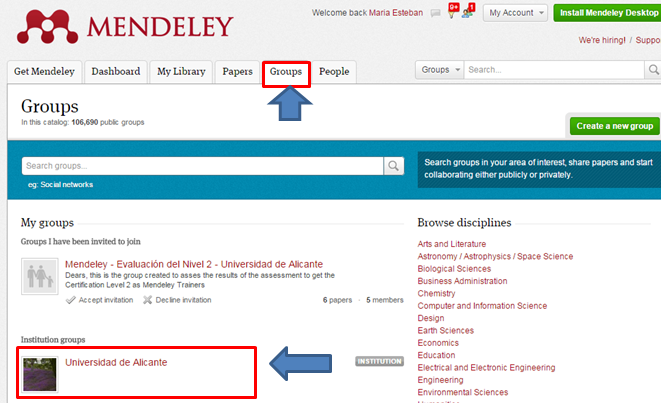 Access your account in Mendeley, select the tab Groups and in the search box enter University of Alicante. Select the group University of Alicante. Click on Join this group and confirm your institutional e-mail account. 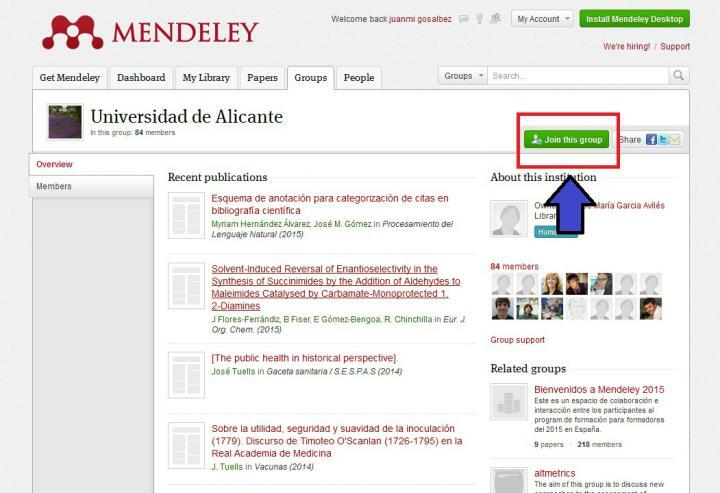 New Users: when opening an institutional e-mail account (at ua.es) Mendeley recognises it as University of Alicante and automatically offers the possibility to confirm the institutional account to join the institutional group. -The guides of help offered by Mendeley. -The guide elaborated by the University of Cádiz Library. The Library offers courses of training on this references manager. For any doubt or additional information, please contact the library . Web version offered for free by Thompson with the licence of the Web of Science, integrated in the platform. It allows a maximum of 50.000 references, 2 GB to store attached documents, and a high compatibility to export references with the information resources in Thompson (Web of Science). Reference Manager Is a bibliographic references manager offered by the Computing Service of the University. For more information on this bibliographic agent please enter this webpage .